Fertility challenges incur huge costs — emotional, financial and communal. But a BirthRATE program could finance Jewish babies faster than free Birthright trips to Israel. Plus…Elliot Jager on being male and childless. “Commerce of Infertility,” © Andi Arnovitz, 2016. www.andiarnovitz.com. Photography: Avshlom Avital. The sun beats down on her as she walks up the steps. Each uphill step a reminder of where she’s been. Each step a physical journey, an emotional climb. You can’t see any of her pain, because it’s hidden behind her positive, helpful, hard-working persona in the community, behind her loving support of her friends, parents, and siblings. She weathers it well. But today it overtakes her. Years of consultations, trials, almosts — and all at once, she falls, publicly, on her knees. Up to this moment, this story is my story. This story may be yours, too. It is the story of Hannah, the woman from the Bible whom the Jewish tradition lauds as the creator of silent prayer. The male rabbis of the Talmud honor this form of prayer above all: a woman, baring it all in public, exposing deep desperation, until she can’t do anything but just collapse and weep, and whisper at the Temple of Shiloh. I never imagined I would be here. My parents said I could be anything I wanted to be when I grew up, if I worked at it. And 90% came true. I became a singer and musician, an educator and a leader…just not yet a mommy. And, trust me, I worked hard at it…. I practiced a lot. I put my mind, body and financial resources on this goal. And here I am, 42, and no closer to becoming a mother. Instead, I’ve become a statistic. The percentage of Jewish women who are childless is slightly higher than that of the general U.S. female population. Fun fact. The majority of all Jewish women age 25–34 are childless, compared to less than half of all U.S. women. From ages 35–39, almost half of all Jewish women remain childless, compared to only one-fifth of all U.S. women. The reality is: I fit the profile. Married at 36, I first attempted to conceive at 38. And, like many of you, after several unfruitful months I consulted a fertility specialist. My first time at the fertility clinic could have been a Jewish General Assembly gathering. I knew half the waiting room. How did I not know all these people were going through fertility challenges? My doctor suggested an aggressive treatment path, In Vitro Fertilization — IVF. And then I had another realization: most health insurance companies do not cover IVF. Translation: most patients are paying out-of-pocket $12,000 to $15,000 for each IVF treatment. Another fun fact: it typically takes multiple treatments. I’m looking at six so far. You do the math. I began to think about all of this. The extreme costs. 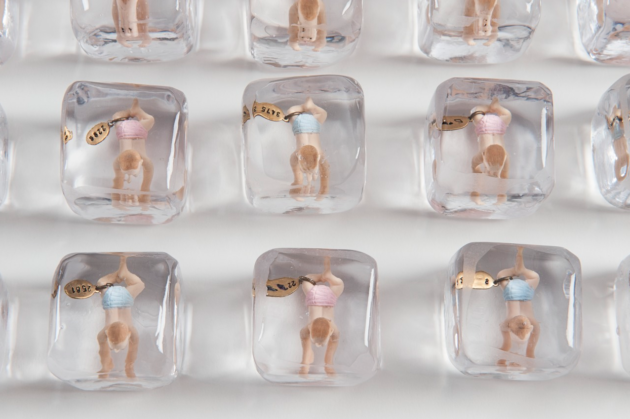 How pervasive fertility challenges are in the Jewish community. How did I not know this before? Why was no one talking about this? So I did. I talked, sharing my fertility challenges with friends and colleagues. It was crazy. Every single woman and man I spoke to had a story. I started posting about my journey on Facebook. 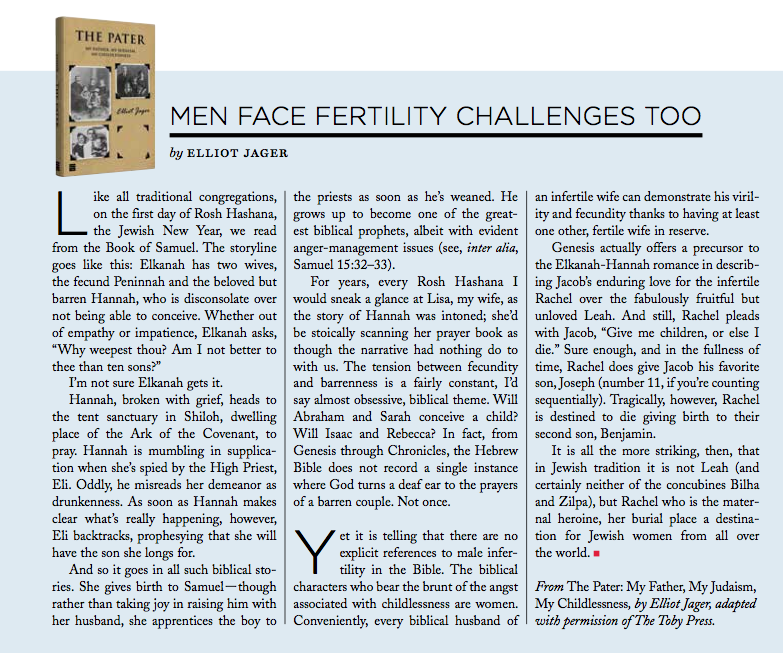 I started writing articles, including one for Sh’ma journal, which, with my loving nudges, published an entire issue dedicated to fertility challenges in the Jewish community. At conferences this past year, when I was speaking or performing, I would do hand-raising polls on whether people in the group knew anyone in their inner circle who had struggled with fertility challenges and the financial burden associated with this. All hands went up, time and time again. And here’s what I discovered. The more I spoke publicly, the more others shared their struggles and journeys with me, many of them confidentially. These men and women were grateful someone was speaking up on their behalf. They felt less alone — and, quite frankly, so did I. One of the hardest parts of a fertility journey is the crippling isolation. Isolation which can affect your work, your finances, your mental health, your romantic and family relationships, your friendships. I mean, to be honest, at times it’s pretty hard to be around expecting women. Or new babies. The fertility journey has an effect on your joy in life, your career goals. It’s all-encompassing. And for way too many people in the Jewish community, it is a silent, secret and sometimes shameful struggle. And why shame? After all, this is so common in 5776. The first couple of chapters of Genesis make it clear what the communal expectation is: the commandment says Be fertile and increase, pru urvu, and fill the world (Genesis 1:28). This order actually precedes the commandment to observe Shabbat…and then we are reminded twice more after the big flood. It’s pretty clear: if you are not part of the solution of growing the Jewish people, you’re part of the problem — the birthrate crisis. If you care about Jewish survival…add that to your plate. You’re welcome. So, what major initiatives have we created for the masses of Jewish men and women experiencing the financial, emotional — and spiritual — struggles of frustrating, painful and costly fertility journeys? What is the Jewish community’s response to this crisis? Up to now, not much. Can our texts be supportive? What do we learn from our two dominant archetypes? Hannah went to the Temple of Shiloh and prayed. She made a bargain with God, via the High Priest, that if she had a son she’d enroll him in all the Jewish programs so he could grow up to help the Jewish community, and her son Samuel did. Sarah, our 90-year-old fertility miracle, challenged God. (“Hey, miracle-maker, if you’re so good, try a 90-year-old, post-menopausal case — ha!”) To which God’s messenger says: There ain’t nothing I can’t do — by next year, you’ll have a son. And, sure enough, she and Abraham did. So, here’s the formula heard every Rosh Hashana: Ask God. Pray. Bargain. Challenge. The result? A child. So I tried it. The scene: me, on an operating table, seconds away from having the anesthesia kick in, my doctor about to retrieve the eggs in my ovaries (stimulated through daily hormone shots) so they can be combined with my partner’s sperm. Lying there in stirrups, counting backwards from 10. Heck yeah, I pray. The next three, four, five days, waiting to see if the eggs fertilize and grow into viable embryos? I pray. And Day Five, back in stirrups, as the viable embryos are inserted into my uterus through a catheter? I pray. For the requisite 20 minutes lying still, hoping the embryo will travel to my uterine wall and implant itself, I pray. On my acupuncturist’s table following the implantation, needles helping things flow, I pray. The result? I wish you could see that I am throwing out my empty arms, despondent. I am feeling desperation, paralysis, profound sadness and isolation. And I am not unique. But maybe the Biblical narratives shed light on something beside the formula of pleading and prayer. For both Hannah and Sarah, prayer wasn’t enough. A partner — an angel or a priest — had to confirm out loud “You will have a child.” Help actually came to intercede. Could that be our Jewish communal role today? What should our contemporary Jewish community be doing to enact that help? The Jewish community historically galvanizes around issues to solve problems through advocacy, initiatives and, of course, money. It’s incredible what we can accomplish working together. Look at Birthright Israel, investing $3,000 per emerging adult, now millions spent to create and sustain the next generation of Jewish babies. I’m serious! The well-circulated Birthright joke is that one of the core funders claimed that the real purpose of free group trips to Israel for Jews under age 26 was to create Jewish babies. Federations, foundations and individuals all line up to help. A communal financial investment of this magnitude is in place potentially to create Jewish babies from a population not likely to produce for another 5 to 15 years, if that. Birthright Israel bets on a hypothetical. Imagine — can we dream for a second? — what about betting on an immediate gain? What if we lowered the barrier to entry around fertility by investing even a fraction of the amount of money spent on Birthright Israel to help individuals or couples ready now, eager now to begin a Jewish family? What kind of a message would that send? With an investment in fertility the Jewish community would be reaching out, embracing people at a most vulnerable moment in their lives. Think of the impact this would have on affiliation and engagement. Imagine how people would feel, connected and grateful to a community that holds you at a time of such great need! If the Jewish community wants to gamble with millions, let’s double down on fertility support. Folks, are you thinking what I’m thinking? We are ready for the “birthRATE” program. Now, we can’t undervalue how important money is to this process. With what I have already spent on fertility treatments I could have sent my non-existent child to Northwestern, my alma mater, for two years (at $48,624 per year) and to Jewish summer camp for multiple summers. Here’s the fact: No one budgets for fertility challenges. But money is not the sole answer to combating the isolation and despair I, and others like me, feel. It’s not good for human beings to feel alone. Back in Genesis, near the part where we receive the commandment to be fruitful and multiply, we also hear that it’s not good for us to be alone. That we need an ezer k’negdo, someone to help us to be successful. And not in the abstract, but k’negdo, right in front of us. We need to feel the community with us, by our side. Here’s how you can serve this role. 1. If you have a fertility story, share it! Fertility challenges are normal, and sharing helps normalize this. 2. Ask questions of your community: What exists currently? Can we create a fertility fund? Can we partner with a local pharmacy to underwrite costs of expensive medications? Are there support or mentoring groups, blogs, websites, counseling resources available? How do people learn about these resources? Promote what’s available and create what’s not. 3. Let’s call on our clergy for proactive outreach. Do they have the training to be helpful? Would your rabbi pool resources with other rabbis to administer a fertility fund? Would they speak about fertility challenges from the bima? Or invite individuals to share their journeys? 4. And let’s give financial support. It’s clear: if one cannot afford to have a child, emotional, spiritual and informational resources won’t solve the problem. If someone uses up all their resources on fertility journeys, they will have no funds for all the other costs of being part of Jewish community. Isn’t it hypocritical to ignore deep struggles and then make fundraising appeals to these financially depleted people? There are future Jewish parents who need our help. Let’s remove the pressure we imply in that first commandment pru u’rvu — be fruitful and increase — and instead focus on “It is not good for humans to be alone.” Focus instead on being the ezer k’negdo, the partner reaching out to help someone in isolation. Naomi Less is associate director of Lab/Shul and a musician and experiential educator. “Jewish Chicks Rock” is her project for girls’ empowerment. 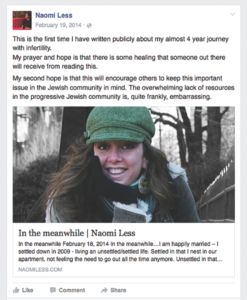 She’s known for her work with Storahtelling and Uprooted: a Jewish Response to Fertility Journeys. infertility. Hasidah is pleased to be part of the solution for this. creation of our future generations.